(Bloomberg Opinion) -- President Donald Trump has slapped oil sanctions on Venezuela, and they will hit hard. Although they haven’t been accompanied by threats to drive the country’s oil exports to zero — as the sanctions on Iran were — they could have a similar effect. There are two strands to the measures: curbs on purchases of the country’s crude, and a ban on imports from the U.S. of the diluents that must be blended with the extra-heavy oil from the nation’s Orinoco Belt so it can flow through pipelines. 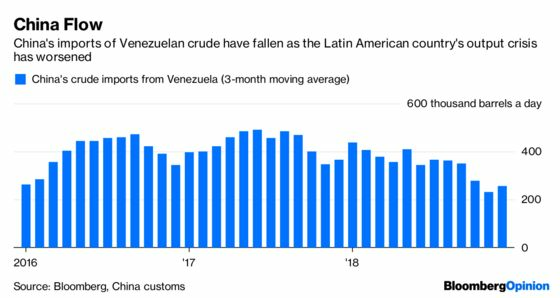 The first will hit Venezuela’s oil exports, unless it can find alternative buyers, while the second will worsen the blow to production levels. Venezuela’s state-owned oil company, PDVSA, has been placed on the Treasury Department’s Specially Designated Nationals list, which generally prohibits U.S. citizens from dealing with named firms or individuals. As a result, international banks and shipping companies will probably cease any transactions, as they did with Russian aluminum giant United Co. Rusal, when it was added to the list in 2018. So there will be no more U.S. purchases of Venezuelan crude, or processing of dollar payments by American financial institutions for sales to foreign buyers. Both of these restrictions come into force at 12:01 a.m. Washington time on March 29, giving a wind-down period of just over eight weeks for contracts that were already in effect on Monday. Unlike the Iranian case, there are no waivers for buyers of Venezuela’s oil. Last year, Venezuela exported an average 514,000 barrels a day of crude to the U.S., according to data from the Department of Energy. That jumped to 608,000 barrels on average during the first three weeks of January. These flows will halt over the next two months. Purchases by non-U.S. entities are not specifically banned, as they are for Iranian oil. However, in practice there may be very few buyers ready to come forward, or banks, shippers and insurers who will be willing to facilitate the trade. The increased profit on a cargo of discounted Venezuelan crude is not likely to be enough to offset the heightened risk of bad blood with the U.S.
President Nicolas Maduro has said that he would divert the country’s oil exports away from the U.S. in the event of sanctions, repeating a threat often made by his predecessor Hugo Chavez to direct the nation’s crude to China rather than America. While this remains possible in theory, it depends on China’s willingness to anger Trump by buying more Venezuelan oil. The Beijing government may not be prepared to take that risk. Just look at how it has responded to the oil sanctions imposed by Trump on Iran. Far from taking them as an opportunity to pick up some cut-price crude, China appears to have cut back its purchases as the restrictions came into effect. 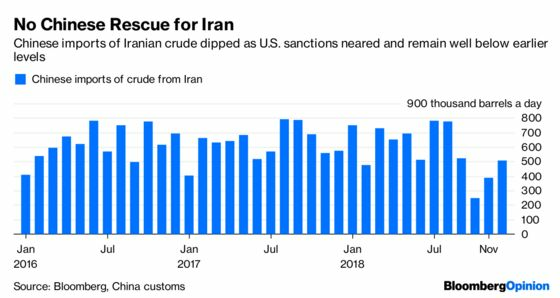 Though China received a waiver allowing it to import 360,000 barrels a day of the nation’s oil, sales are still well below the levels reached in 2017 and the earlier part of 2018. Just like their counterparts elsewhere, China’s state-owned oil companies do not want to jeopardize their access to the U.S. dollars they need to run their international operations. This may make them less willing than Maduro hopes to pick up the slack caused by the sanctions, even though Beijing has sided with him against the U.S. The bigger threat to Venezuelan oil, though, may come from the immediate ban on the delivery of diluents. Much of the Orinoco Oil Belt output needs to be diluted with lighter grades to reduce its viscosity. This allows it to flow through pipelines to the coast for export or processing, and to creates a product that is attractive to overseas refiners. A shortage of diluent from domestic sources means much has to be imported to maintain flows of Orinoco crude, and the U.S. is the closest major source of a suitable light oil, either in the form of light crude from the shale patch, or heavy naphtha from refineries. They could come from further afield — occasional cargoes of light Saharan Blend crude from Algeria have been used — but this will raise costs and the trade will still be subject to the payment restrictions that would prevent settlement in dollars. U.S. sanctions on Venezuelan crude are not an Iran-style embargo, but they might as well be.